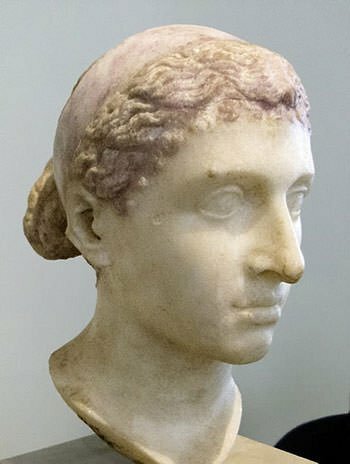 Cleopatra VII Philopator (69 BC – 30 BC), popularly known as just Cleopatra, was an Egyptian queen who was the last active Pharaoh of Egypt. Ascending the throne at the age of 18, she co-ruled Egypt with her younger siblings and then with her son Ptolemy XV Caesarion. In an era when Egypt and Rome was embroiled in internal and external battles, she established her power, stabilized her kingdom and greatly influenced the politics of the time. Among other things, Cleopatra led a fleet at the naval Battle of Actium and influenced the way Western empires would be governed. Moreover, she went on to inspire art and literature for centuries. 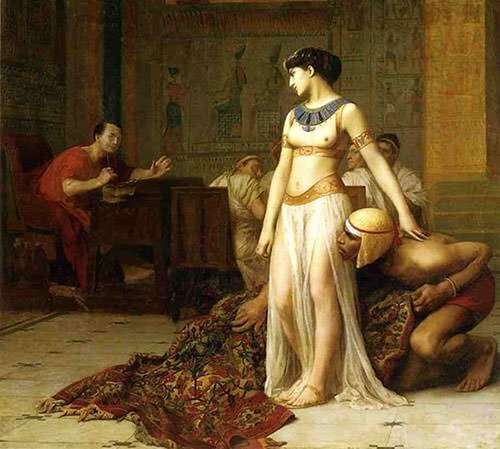 Know more about the enigmatic Egyptian queen Cleopatra through her 6 major accomplishments. In the history of the Mediterranean, the Hellenistic period begins with the death of Alexander III of Macedon (commonly as Alexander the Great) in 323 BC. Ptolemy (Ptolemy I Soter), a Macedonian and among the high ranking generals of Alexander during his conquest of Egypt in 332 BC, was appointed as the satrap of Egypt after Alexander’s death. This marked the beginning of a 300 year rule of the Ptolemaic dynasty over Egypt. The Ptolemaic dynasty was, with time, accepted by the Egyptians as the successors to the pharaohs of independent Egypt. Cleopatra was the last active ruler of the Ptolemaic Kingdom of Egypt ascending the throne in 51 B.C. after the death of her father Ptolemy XII Auletes. Cleopatra ruled jointly with her younger siblings Ptolemy XIII Theos Philopator (51–47 BC) and Ptolemy XIV (47–44 BC); and then with her son Ptolemy XV Caesarion (44–30 BC). 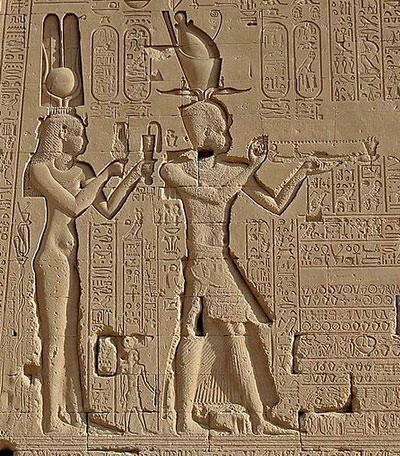 She mostly had the political power to herself, being the dominant ruler in all three of her co-regencies, thus she was in all practical sense the last active Pharaoh of Egypt. The Ptolemaic Kingdom in Egypt ended with her death with the emergence of the Roman Empire in Egypt after the Battle of Actium in 31 BC. Ptolemaic Pharaohs though accepted by the Egyptians and being crowned with Egyptian rituals at Memphis by the Egyptian High Priest of Ptah, had their roots in Greece. They spoke Greek and governed from the largely Greek city of Alexandria as Hellenistic Greek monarchs, refusing to learn the native Egyptian language. Cleopatra was however an exception, she could speak multiple languages, most importantly Egyptian, the language of her subjects. Cleopatra also spoke her native Koine Greek, Latin and Arabic along with Ethiopian, Troglodyte, Hebrew, Parthian, Median and the Syrian language. Some infer that her interest in such wide array of languages reflected her desire to restore North African and West Asian territories that were once part of the Ptolemaic Kingdom. Ascending the throne of Egypt at the young age of 18, Cleopatra was ambitious in her desire to rule. Although a co-regent, she commanded power in Egypt throughout her reign and kept it independent in times of political turmoil. She formed relationships and political alliances with powerful Roman generals like Julius Caesar and Mark Antony, providing them resources and finance to further their ambitions. She was also the enemy of Octavian, who would later become the first Roman emperor Augustus. Cleopatra played a vital role in Augustus’s propaganda war against Antony which paved the way for his rule. He was determined that Roman history should be recorded in a way that validated this right. Cleopatra was thus stripped of any political influence and her role was diminished to her relationships with Julius Caesar and Mark Antony. She was painted as an immoral foreign woman who tempted upright Roman men. However, in reality, she greatly influenced the politics of Rome. In the time leading to the famous naval battle at Actium, Antony tried to persuade Cleopatra to withdraw to Egypt but Cleopatra refused, thinking that blocking Octavian in Greece was more favourable in the defence of Egypt. In September of 32 B.C. 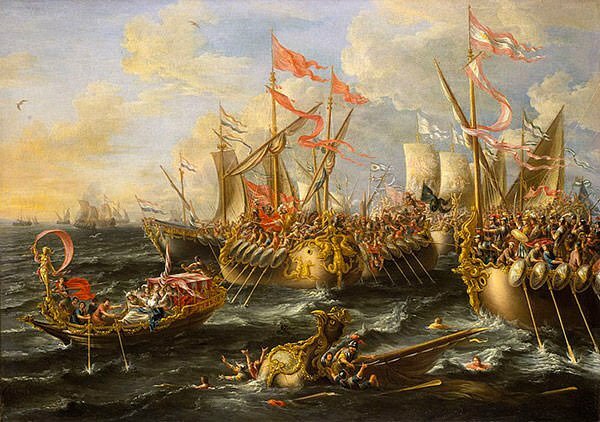 the larger but untrained naval fleet of Antony and Cleopatra met the professional naval forces of Octavian led by Marcus Vipsanius Agrippa in the Battle of Actium. Cleopatra aboard her flagship, the Antonias, commanded several dozen Egyptian warships at the mouth of the Ambracian Gulf. The battle, however, soon became one sided with officers, kings and generals defecting to Octavian’s side. Cleopatra and Antony were thus forced to break through the Roman line and flee to Egypt. Cleopatra popularized the idea of ruler worship, influencing the way Rome and other western empires would be governed in the future. There are clear indications that she had convinced two of the most powerful Roman generals and her consorts Julius Caesar and Mark Antony to rule as her partner in the guise of Greek and Egyptian Gods Dionysus – Isis. At the Lupercalia festival, a month before Caesar’s death, while Cleopatra was in Rome, Antony attempted to place a royal Diadem on Caesar’s head, with the latter refusing. This was most likely a staged performance, to gauge the Roman public’s mood about accepting Hellenistic-style kingship. After his victory over Armenia in 34 B.C. Antony held a Roman style victory parade in Alexandria dressed as Dionysus and riding into the city on a chariot to present the royal prisoners to Cleopatra, who was seated on a golden throne. Antony and Cleopatra’s twin boy and girl were named Helios (the Sun) and Selene (the Moon) respectively, indicating the couples elaborate plans for the future. 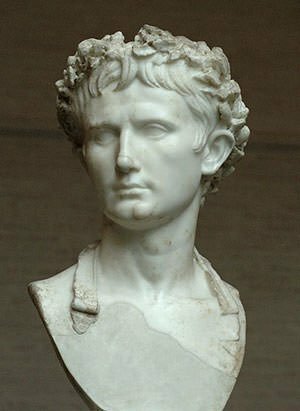 The idea of ruler worship was in a way soon adopted by Octavian when he became the first emperor of Rome taking the title of Augustus (The Majestic). Centuries after her death Cleopatra still captivates historians, storytellers, artists and the public in general. The most staring example being Shakespeare’s play Antony and Cleopatra (1606–07) which was inspired from Roman historian Plutarch’s Parallel Lives. It was the work of the masterful playwright that immortalized Cleopatra, making her into the popular cultural icon that she is. Many plays, poetry, paintings, operas and movies have since been made on the Egyptian queen. Her image of being an exotic seductive queen are still used to sell a wide range of products.